What is the customs process in Qatar to import? Who are the parties involved in import customs clearance formalities in Qatar? Import cargo clearance in Qatar Customs. How is import cargo released from Qatar Customs to importer? The information provided here details on how to import goods to Qatar especially import customs clearance procedures in Qatar. General Authority of Customs is the official customs department of Qatar that looks after importation and exportation of goods in and out of the State in compliance with the governing legislation in this regard. This authority is overseen by the Ministry of Finance. 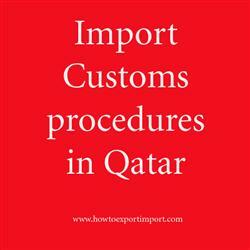 Import customs procedures required in DOHA. Import Customs process in DOHA. Process to import to DOHA. Requirements of customs to import to DOHA. Customs requirements in DOHA to import. Customs needed to import to DOHA. How can I clear customs to import in DOHA.